China's functional neurosurgery forum adds endoscopic minimally invasive spine surgery to their 2017 meeting agenda. Citation: AYeung T Anthony. China’s functional neurosurgery forum adds endoscopic minimally invasive spine surgery to their 2017 meeting agenda.. J Brain Neurol 2017;1(1):4-5. The China Forum on Functional Neurosurgery held an International meeting on Sept 16-17, 2017. The program’s agenda of Morning Plenary Sessions consisted of invited foreign experts from the USA, Canada, France, Japan, South Korea, and Taiwan. The Chinese members of the Chinese Institute provided the plenary Session on functional neurosurgery by futuristic talks by their Chinese faculty members. Professor Yongjie Li, Chair of the 2017 Forum on Functional Neurosurgery, welcomed the attendees with a message about the future of functional neurosurgery that encompasses neuronavigation, surgical robots, visual and augmented reality. Professor Yongie Li, the director of functional neurosurgery, at Xuanwu hospital of Capital Medical University, established the first functional neurosurgery center in China . Professor Hongwei Zhu, also from Capital Medical University, after listening to an academic talk on the state of endoscopic surgery, came to Phoenix to study and see the transforaminal endoscopic technique first hand for himself . He then convinced his colleague, to feature endoscopic spine surgery as the next “break-through” in functional neurosurgery in China . They were both encouraged by orthopedic trained fellows Xifeng Zhang, and Yinggang Zheng, to bring endoscopic technology to China. On this occasion, Minimally Invasive Endoscopic Spine Surgery was, for the first time, an integral part of the main meeting in plenary sessions that included presentations on Endoscopic spine surgery by Dr Anthony Yeung, from the USA and Dr Gun Choi from South Korea, and Girish Datar, all students of Dr Yeung . All three are key opinion leaders on endoscopic spine surgery. Dr Yeung covered the rationale of his selective endoscopic discectomy, a technique for surgically treating the pain generators in the lumbar spine by reviewing the role of chymopapain mediated intradiscal therapy . Selective endoscopic discectomy technique was trademarked by Dr Yeung to represent the concept of “surgical pain management” for a wide spectrum of painful patho-anatomy in the lumbar spine. Grish Data spoke of foraminoplasty as an extension of selective endoscopic discectomy, and Gun Choi reported on the state of the art of Endoscopic Spine Surgery that evolved to successfully treat common pathology in the cervical, Thoracic, and Lumbar Spine . The previous year Dr Yeung introduced endoscopic spine surgery to the Chinese Functional Neurosurgery Meeting Organizers. China has been encouraged to become a leader in new technologies by policies instigated by President Xi, and endoscopic surgery of the spine qualified for that directive. Along with Drs Yeung and Choi, International experts in the field exposed the attendees of the 2017 meeting with comprehensive presentations on functional neurology, neurosurgery, and pain management. In three parallel afternoon sessions, covering two days on movement disorders, epilepsy surgery, and minimally invasive spine surgery, enthusiastic attendees could choose to attend any of the three parallel sessions. On Sunday, the plenary sessions covered Deep Brain Stimulation, Peripheral Nerve Stimulation, and Multimodal Evaluation for Refractory Epilepsy, Neurosurgery for Various Types of Dystonias, and an Update on Spinal Cord Stimulation . The parallel sessions covered Neuromodulation for epilepsy, Micro vascular Decompression but highlighted by live operation demonstrations of endoscopic cervical and lumbar decompressive surgery, followed by select presentations on minimally invasive spine surgery by international faculty [8,9]. One surprise event was the Introduction of the Yeung Endoscopy Spine Society, attended by 40 of Dr Yeung’s Chinese spine fellows who received training by Dr Yeung through Chinese government education programs and partial Industrial sponsorships by Bonovo’s Academic Alliance, Elliquence, a radiofrequency endoscopic modulation company and Accuretech, a Holmium: Yag laser company . The original club designation now has official Society Status for Chinese government recognition, and Xifeng Zhang was elected the first president. The addition of endoscopic spine surgery complements the goal and expanded platform of functional neurosurgery to add endoscopic spine to their Brain platform as China aims to be a world leader in functional neurosurgery by adding endoscopic surgery to their clinical platform. Left to right Liang Qiao, Wei Tao, Conference Chair Yongjie Li, Anthony Yeung, Xifeng Zhang, Hongwei Zhu. Left to right Hongwei Zhu, Yongjie Li, Girish Datar, Anthony Yeung holding the commemorative album of the Yeung Endoscopic Society (Figures 1-3). 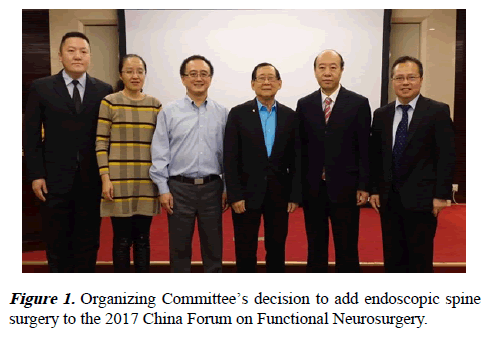 Figure 1: Organizing Committee?s decision to add endoscopic spine surgery to the 2017 China Forum on Functional Neurosurgery. Figure 2: Dr Yeung presenting keynote address on Selective Endoscopic Discectomy address at morning plenary session of CFFN 2017. 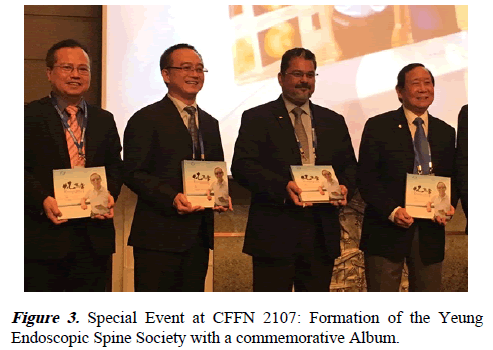 Figure 3: Special Event at CFFN 2107: Formation of the Yeung Endoscopic Spine Society with a commemorative Album. Yeung AT, Tsou PM. Posterolateral Endoscopic Excision for Lumbar Disc Herniation: Surgical Technique, Outcome, and Complications in 307 Consecutive Cases. Spine. 2002;27:722-31. Yeung AT, Yeung CA. Microtherapy in Low Back Pain. In: H. Mayer, Munich, eds. Minimally Invasive Spine Surgery: A Surgical Manual. Germany: Springer Verlag; 2005. p. 267-77. Yeung AT, Yeung CA. Arthroscopic Lumbar Decompression: The Foraminal Approach. In: Corbin T, Connolly P, Yuan H, et al. Eds. Emerging Spine Surgery Technologies: Evidence and Framework for Evaluating New Technology. USA: Quality Medical Publishing Inc; 2006. p. 291-305. Gore S, Yeung AT. The "inside out" transforaminal technique to treat lumbar spinal pain in an awake and aware patient under local anesthesia: results and a review of the literature. Int J Spine Surg. 2015;8. Weiner R, Yeung AT, Perryman L, et al. Treatment of FBSS low back pain with a novel percutaneous DRG wireless stimulator: pilot and feasibility study. Pain Medicine. 2015;17:1911-6. Yeung A, Yeung CA. Endoscopic Identification and Treating the Pain Generators in the Lumbar Spine that Escape Detection by Traditional Imaging Studies. J Spine. 2017;6:369. Yeung AT. Failed Back Surgery Syndrome: Endoscopic Documentation of Common Causes by visualization of Painful Patho-anatomy in the hidden zone of the axilla containing the Dorsal Root Ganglion and Salvage treatment of Neuropathic pain with DRG neuromodulation. SF J Neuro Sci. 2017;1:1. Zhang X, Du J, Yeung AT. Development of Percutaneous Endoscopic Lumbar Discectomy (PELD) Technology in China. J Spine. 2017;6:374. Yeung AT, Yeung CA, Salari N, et al. Lessons Learned Using Local Anesthesia for Minimally Invasive Endoscopic Spine Surgery. J Spine. 2017;6:377. Yeung AT. In-vivo Endoscopic Visualization of Pain Generators in the Lumbar Spine. J Spine. 2017;6:385.